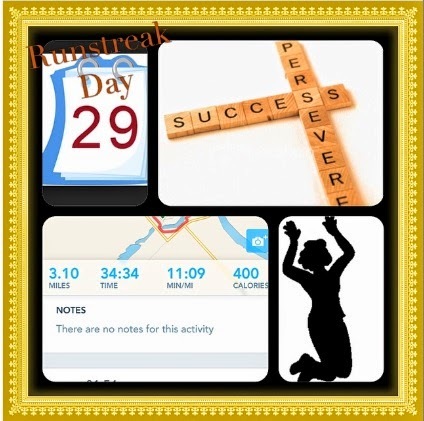 I've made it 30 days now on my runstreak! On Monday, day 29 I went out and finally ran a 5k without walking. It's been ages since I've done that. I'm pretty sure the last time was when I ran my half marathon in Utah in MARCH. I know when I was running longer distances the first 2 miles always seemed the hardest. Which is really weird, but it's like after 2 miles you kind of get into a rhythm and you've worked out all those little kinks in your body (or told them to shut up!). So I've hit the gateway drug mileage for me where in my brain at least, I know that I can do it. Anyhow, I couldn't help but reminisce about the day that I first finished the couch to 5k program and ran for 30 minutes straight. I've been adding a little bit of mileage each week to do a couple days a week with shorter runs in between. I need to work out how much I need to add to get up to a 10k. I am signed up to do one October 25th. It would be nice if I could run the whole thing. I can't find anything saying if it's hilly or not, but it's along the shoreline in Berkeley so I'm thinking it shouldn't be TOO bad. I can hope right? I know you can do a 10 km! AS you know, there's no way in hell I could!